In order to fit the exact space requirements and maximize storage, the walk-in cooler/freezer was manufactured to the actual size by utilizing Thermo-Kool’s high density DURATHANE panel perimeter which allows flexibility in design and the ability to manufacture in 1” panel increments. 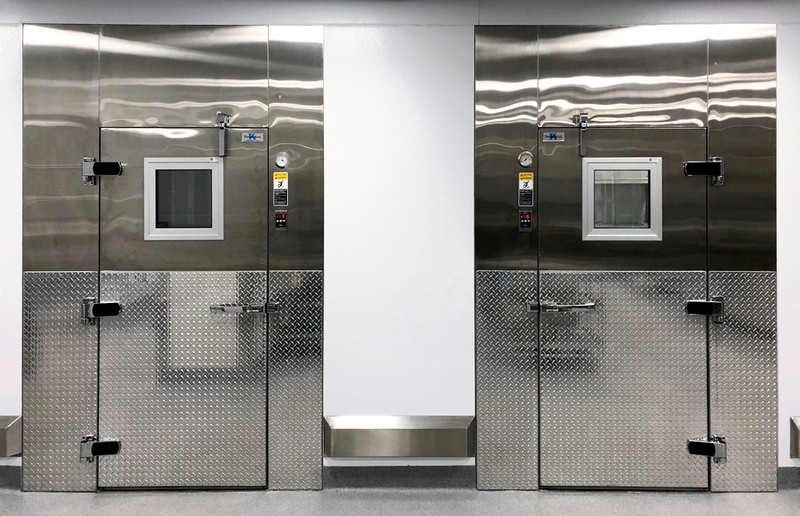 As is the standard Thermo-Kool protocol, the walk-in cooler/freezer was preassembled at the factory prior to shipment for a thorough quality control inspection to ensure a quick and trouble–free installation with no hidden costs. Since aesthetics are important to the school, the Thermo-Kool walk-in cooler/freezer was provided with a white stucco aluminum finish on the exposed exterior with stainless steel doors and frames. The interior ceiling finish of the walk-in cooler and freezer is also white stucco aluminum which partnered with 48” LED lights provides maximum illumination on the interior of each compartment. Both the cooler and freezer compartments were floorless with 12” tall foamed screeds to accommodate a 10” recess. The 38” x 76” door assemblies consist of Thermo-Kool’s patented heavy reinforced steel u-channel door frame design which ensures extra support and rigidity to the door section. The entrance door has continuous steel backups which are foamed-in-place in the door to accommodate all hardware placement. In addition to the standard door hardware, each door assembly includes a 14” x 14” heated peep window, deadbolt locking handle, vinyl strip curtain, heater in both the door and frame, a temperature alarm/door monitor with a panic switch, motion detector, battery backups and dry contacts, thermostatically controlled heater wire, and 1/8” aluminum treadplate kickplates and jamb guards 48” high on the interior and exterior. For additional panel protection to the front of the walk-in cooler/freezer, custom stainless steel sloped top bumper rails were provided on the exposed exterior. The project was designed and specified by Rippe Associates Foodservice Design + Consulting, Minneapolis, Minnesota. Thermo-Kool Customer Account Representative, Jessica Ramsey, worked with Bob Wiltgen, Contract & Design Specialist and Kip Opheim, Project Coordinator with Rapids Foodservice Contract and Design, Marion, Iowa and Thermo-Kool Marketing Agent, Bill Wright with Paragon Marketing, St. Louis, Missouri.